Hey You, Pikachu! (ピカチュウげんきでちゅう or Pikachū Genki dechū in Japanese) is a Nintendo 64 game released in 2000. It was developed by Ambrella and published by Nintendo. Its Japanese name is Pikachu Genki dechū, a pun on "Pikachu genki desu" (Pikachu is fine). It stars Pikachu. 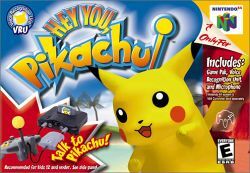 The game features voice-recognition technology; this is used to talk to Pikachu. It is also the only game that utilizes the platform's Voice Recognition Unit (VRU). Besides talking to Pikachu, the player can move around and pick up items. Despite being geared towards small children, there was a pamphlet included with the VRU that mentioned how the microphone may be unable to pick up younger voices. This page was last edited on 7 September 2015, at 05:48. This page has been accessed 14,096 times.